Autumnal displays may be dimmed in the future. Most of the autumn leaf-shedding trees in Australia are not native, and some are declared weeds. Nevertheless, Australia has a spectacular display of trees, from the buttery tresses of Ginkgo biloba to the translucent oaks, elms and maples. Autumn colour changes are celebrated worldwide and, when the time is right, autumn leaves reconnect us to nature, driving “leaf-peeping” tourist economies worldwide. However, recent temperature trends and extremes have changed the growing conditions experienced by trees and are placing autumn displays, such as Canberra’s, at risk. Autumn leaf colour changes and fall are affected by summer temperatures. This year, Canberra, like the rest of Australia, endured its hottest summer on record. In NSW and the ACT, the mean temperature in January was 6°C warmer than the long-term average. So far, autumn is following suit. These extremes can interrupt the ideal synchronisation of seasonal changes in temperature and day length, subduing leaf colours. In addition, hotter summer temperatures scorch leaves and, when combined with this and the previous years’ low autumn rainfall, cause trees to shed leaves prematurely, dulling their autumn leaf displays. We learnt in childhood autumn colour change follows the arrival of cooler temperatures. Later we learnt the specifics: seasonal changes in day length and temperature drive the depletion of green chlorophyll in leaves. Temperature can also affect the rate at which it fades. In the absence of chlorophyll, yellows and oranges generated by antioxidants in the leaf (carotenoids) as well as red through to purples pigments (anthocyanins), synthesised from stored sugars, emerge. Temperature plays a role here too – intensifying colours as overnight temperatures fall. We’ve also come to understand the role of a leaf’s environment. Anthocyanin production is affected by light intensity, which explains why sunny autumns produce such rich colours and why the canopies of our favourite trees blush red at their edges while glowing golden in their interior. However, early signs show this year’s autumn tones will be muted. After the record-breaking heat of summer and prolonged heat of March, many trees are shrouded in scorched, faded canopies. The ground is littered with blackened leaves. Of course, we’ve seen it before. 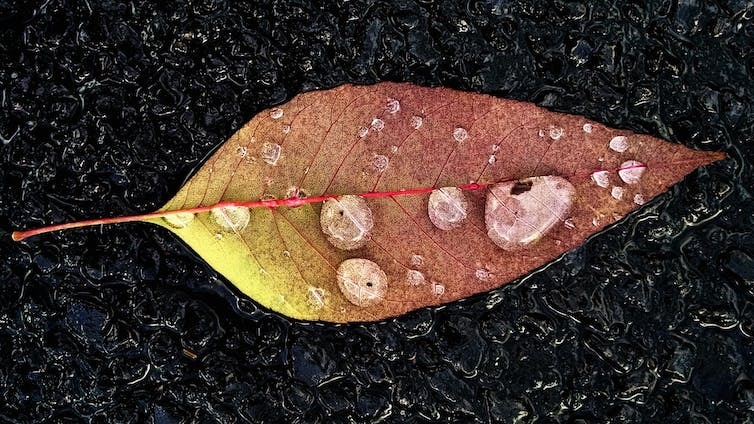 During the Millennium Drought, urban trees sporadically shed their leaves often without a hint of colour change. Fortunately, that was reversed at the drought’s end. But we’re kidding ourselves if we believe this last summer was normal or recent temperature trends are just natural variability. If this is a sign of seasons future, we need to prepare to lose some of autumn’s beauty. Long-term and experimental data show that the sensitivity of autumn colour change to warmer temperatures varies widely between species. While large-scale meta-analyses point to a delay in the arrival of autumn colours of one day per degree of warming, individual genera may be far more sensitve. Colour change in Fagus is delayed by 6-8 days per degree. Warming temperatures, then, mean the cohesive leaf-colour changes we’re accustomed to will break down at landscape scales. In addition, as warm weather extends the growing season and deep-rooted trees deplete soil moisture reservoirs, individual trees are driven by stress rather than seasonal temperature change and cut their losses. They shed leaves at the peripheries of their canopies. The remainder wait – bronzed by summer, but still mostly green – for the right environmental cue. For years, careful species selection and selective breeding enhanced autumn colour displays. This rich tapestry is now unravelling as hotter summers, longer autumns and drought affect each species differently. It seems logical warmer temperatures would mean shorter and less severe frost seasons. Paradoxically, observations suggest otherwise – the arrival of frost is unchanged or, worse, occurring earlier. When not preceded by gradually cooling overnight temperatures, frosts can induce sudden, unceremonious leaf loss. If warm autumn temperatures fail to initiate colour change, autumn displays can be short-circuited entirely. At the centre of many urban-tree plantings, our long association with elms faces a threat. Loved for the contrast their clear yellow seasonal display creates against pale autumn skies, elm canopies have been ravaged by leaf beetles this year. Stress has made trees susceptible to leaf-eating insects, and our current season delivered an expanse of stressed, and now skeletal, trees. Autumn leaf displays drive tourism. This dulled image of autumn is far from universal. Climates differ between locations. So too will the climate changes we’ve engineered and their impact on autumn displays. Increased concentration of anthocyanins associated with warmer summers has, for example, created spectacular leaf displays in Britain’s cooler climates. Of course, we’ll continue to experience radiant autumn displays too. In years of plentiful rain, our trees will retain their canopies and then, in the clear skies of autumn, dazzle us with seasonal celebrations. However, that too may be tempered by the increased risk of colour-sapping pathogens, such as poplar rust, favoured by warm, moist conditions. And there are also negative consequences for autumn colour associated with elevated carbon dioxide concentrations. Of course, we need to keep it in perspective – the dulling of autumn’s luminescence is far from the worst climate change impacts. Nevetheless, in weakening our link with nature, the human psyche is suffering another self-inflicted cut as collective action on climate change stalls. 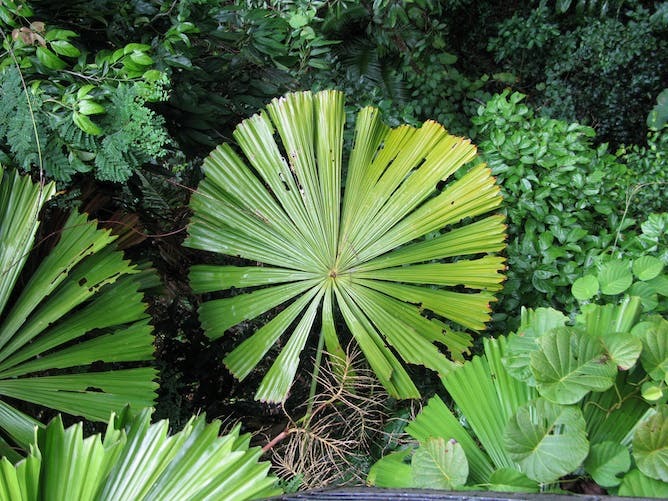 Leaf sizes vary according to a complex mix of temperature and water. 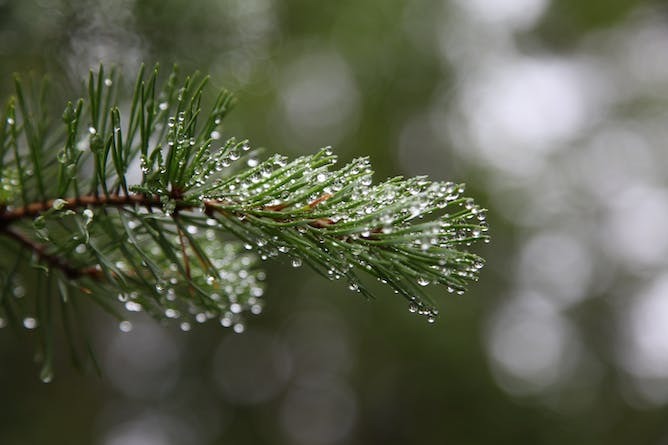 Conifers, which grow in very cold climates, grow thin needles less vulnerable to frost. 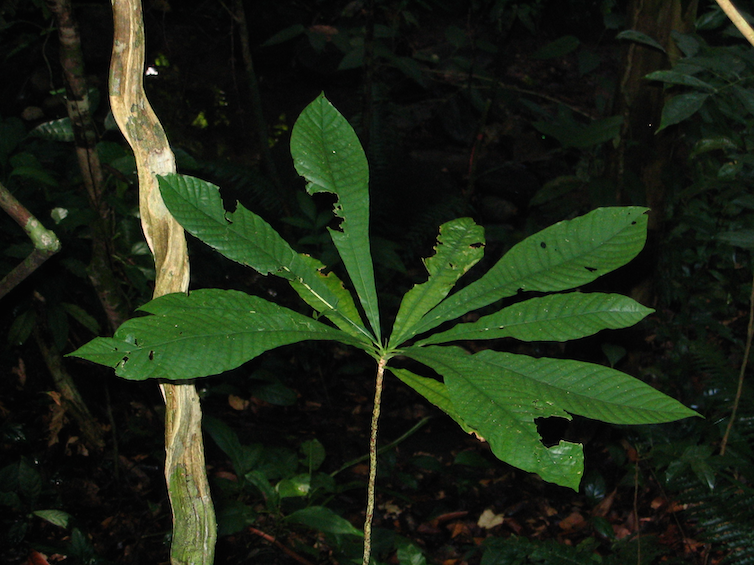 Rainforest plants under the tree canopy can grow huge, complex leaves. 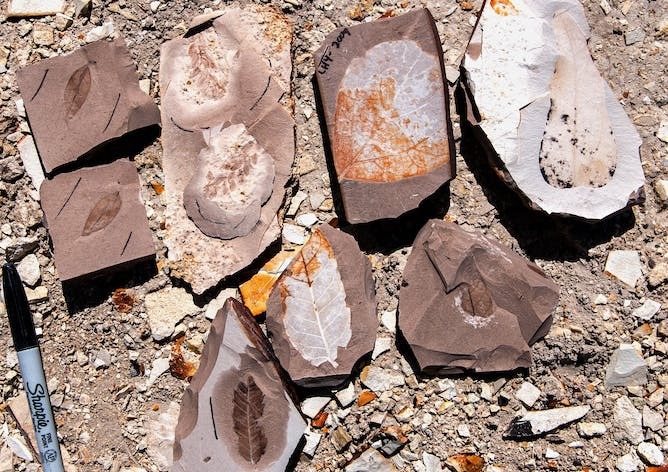 Understanding the mechanisms behind leaf size means leaf fossils – like these examples from the Eocene – can tell us more about climates in the past. The view from a canopy crane at the Daintree in Queensland.